Every town in Alsace France is like a postcard, beautifully coloured house’s, small streams and stalks nesting on roofs. Alsace towns make you feel like you are stepping into a 1600’s canvas painted by one of the masters. Colours and designs hit you from all directions. You drive through the countryside and you see miles and miles of grapes and produce growing as far as the eye can see. It is an amazing area on the French/ German Border with many things to do in Alsace. There are Alsace attractions everywhere you look. Every windy road, every small village will provide you with a unique experience. Chateau Haut Koenigsbourg through the centuries has fallen under the banner of the Habsburgs and Wilhelm II the last of the German Emperors. We opted to for a self-guided tour with an audio guide so we could explore at our own pace. Koenigsbourg has 3 levels to explore on your self-guided tour. Take your time to stroll the castle some of the views are amazing. We took 2 plus hours to wander the castle but much longer could be spent without time restrictions. The castle has a restaurant, souvenir shop and toilets on site. Click HERE for a more detailed article on our visit to Chateau Haut Koenigsbourg. Chateau Haut Koenigsbourg sits up on its mountains at an altitude of 800 meters like a king overlooking his kingdom. This king had a 270-degree view over all his lands and can see any challengers coming from miles away. The view reaches as far as the black forest in Baden Wattenberg Germany. These days all that is surveyed is tourist streaming up the roads of the Vosges Mountains that lead to Chateau Haut Koenigsbourg. Visit Keonigsbourg as a part of an Alsace highlights day tour. Experience the beauty of the Alsace region on a day tour from Strasbourg. Visit Colmar and Eguisheim. Stop at a typical Alsatian winery for a tasting session. Explore the fortified town of Riquewirh and follow the Wine Route to Haut Koenigsbourg Castle. This full day tour leaves from STRASBOURG. For more information and booking click “>HERE. Kayserberg is located between Colmar and Ribeauville. 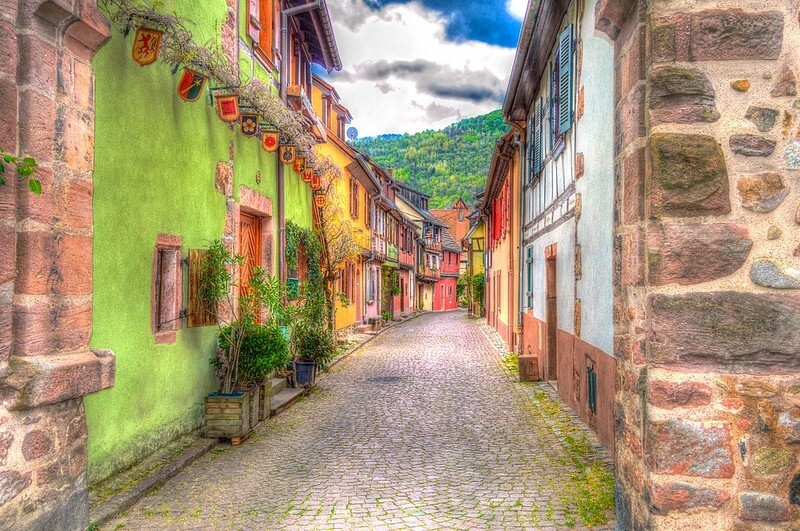 Kayserberg is generally considered to be one of the most attractive small towns in the Alsace region. The ruins of Chateau de Kaysersbergs sits on a hill on the outskirts overlooking this amazing little town. The chateau was built in the 13th century when an important trade route used to pass through this valley. This route has been protected since Roman times. The town sits in a valley with hills full of grapes raising around it. The Weiss river runs through the town. You cross over the river on a beautiful 16th century stone bridge which adds more charm to this already mesmerising picturesque town. The main street is full of amazing colourful wood and stone houses dating back to the 16th century. The Keyserberg Christmas markets rank among the most popular in Alsace. Kaysersberg features on the Alsace Wine Route. The wine route plays a big part in Alsace tourism. For some, the wine is the best of Alsace. The wine route is popular with many tourists as it passes through many picturesque villages and vineyards that cover the hills of this area and the small towns of France in Alsace. La Montagne des Singes is home to 200 Barbary Macaques. A 60-acre reservation on a mountainside in France is a strange place to find monkeys I must agree. This is an amazing sanctuary for these animals. The Barbary Macaques is listed as an endangered species by the United Nations. La Montagne des Singes is playing its part in the conservation and breeding of these monkeys. Since the reservation has been in use 600 of its Barbary Macaques have been re-introduced back into their natural habitat in northern Africa. Some amazing regional Home-Style Alsatian Dishes you should try. A big part of visiting regions like Alsace France is the food. make sure you indulge in the regional Alsace cuisine. Sauerkraut with Fish in Cream Sauce. Pike Perch Braised in Pinot Noir. Family Travel Tip: Make sure you look up the times for the feeding of the monkeys. The park staff put on a presentation and a question and answer time while feeding the monkeys. The kids will love this as nearly all the 200 monkeys in the park converge on the one place. Ribeauville has an amazing main shopping street, maybe the best in the Alsace region. The Grand Rue is a narrow street that winds it was up a slight incline while featuring a castle on a hill that always sits in your line of sight. There is 3 castle on the hills that surround Ribeauville. Chateau Saint-Ulrich, Chateau Ginsberg and Chateau Haut-Ribeaupierre all overlook the town. There is marked walking trails that lead from the town that passes all three castles. The street is filled with boutique shops selling the best produce of the Alsace region. Drinking and eating are a popular activité Alsace. Beer, Wine from grand cru vineyards of Alsace, meats, cheese, fruit, and vegetables along with handicrafts are readily available. Along with the other towns, I have mentioned Ribeauville has an abundance of beautiful houses and building that will have to reach for the camera. Ribeauville has preserved some of its medieval fortifications as part of the town walls and as watchtowers are still standing today. Ribeauville features as part of the Alsace Wine Route. Riquewihr is the smallest of the amazing towns we visited in Alsace. It’s another typical tradition town of the region bright coloured house and cellars full of wine. The tightly built house date back from the 15th century onwards. The town walls once used to protect the town and now covered in the grapes. The Dolder town gate dates back to the 13th century. Riquewihr is sometimes known as The Gem of the Alsace Vineyards. Riquewihr is home to one of the most famous Alsace wine house Dopff Au Moulin. Dopff is famous worldwide for its Alsace Gewurztraminer and is one of the major vineyards to visit in Alsace. The tourist office can provide you with a map so you can explore the historic town of Riquewihr and the best of Alsace. Family Travel Tip: Riquewihr is also home to the most amazing Christmas shop that you will ever see. Two floors of every type of Christmas decoration and trinkets you could ever imagine. Our kids were mesmerised by this shops we had trouble getting them out the door. Who would have thought that there is a museum dedicated to Ginger Bread? Well in Alsace such things exist. Visiting a Ginger Bread museum is certainly one of the unique things to do in Alsace. This amazing Alsace museum is in Gertwiller. The museum guides you through 5 different fun themed gingerbread worlds of Alsace. You will move through the Attic which explains you the history of Alsatian Gingerbread. In all these worlds you will be guided by The Mannele ( French for a Gingerbread Man ). The bedroom takes you through interactive games and helps you discover the legend and smells of the Gingerbread. The Mannele’s Kitchen world shows you how the traditional Alsace Gingerbread is made. The world of Hansel and Gretal in the amazing garden shows you an enchanted world of all things gingerbread before you finish up in the Christmas traditions in Alsace. This should certainly be on your any Alsace tourist map you are following. As you exit the Gingerbread museum you enter the shop which sells the Alsatian Gingerbread. You will find Gingerbread in all shapes, sizes and flavours. You will also find other regional specialities, such as wine, beer, jams, biscuits and more. The Colmar Christmas Market is the most famous of the Alsace Christmas markets. Visiting the Colmar Christmas Market at night is an assault on your sense in all directions. Visually its amazing with Christmas lights making the evening darkness dance, with the food smells making your mouth water and the sounds of Christmas bring joy to your ears. The Colmar Christmas market is certainly an experience. The Colmar town centre is a pedestrian zone making it totally accessible for the whole family to experience the area safely. You will find carousels and ice rinks, you will find local crafts and gourmet delicacies. The Colmar Christmas Market generally runs for 5 weeks finishing just before New Year’s Eve. The Noel en Alsace ( Christmas in Alsace ) is the most popular time to visit. You will find Alsace Christmas Markets in most towns with popular markets located in Munster, Keysersberg, Turckheim, Eguisheim, Ribeauvillé, Riquewihr, Neuf Brisach and Rouffach. Each of these towns celebrates Noel en Alsace with a different theme. Alsace is located in Eastern France on the border with Germany and Switzerland. Alsace France is best accessed by Strasbourg Airport or the Basel Mulhouse Freiburg Airport. We recommend MOMONDO for your flight searches. From Paris the TGV fast train services to Basel, Strasbourg and Freiburg. From Germany, Freiburg is the key access point for transport arrivals by train and bus. All the areas of The Alsace Region are conveniently linked by public transport. There is a network of buses and coaches. The most simple way to organize your trip is to plan your public transport needs on the Vialsace. Alsace destinations are accessible by 2500 km of bike paths and green paths. This makes the Alsace region very attractive for cyclists. The A 35 motorway crosses Alsace from the North to the South going through Strasbourg, Colmar, Mulhouse et Saint-Louis. You can exit here for Basel. Alsace has accommodation options for every budget from Hostels, to apartments and hotels rooms. Hostels can start from as little as 16 Euro a night for a shared dorm room. Hotels in Alsace generally start from around $88.00 a night for a double room 3star and increase incrementally as the luxury rating rises towards the 5-star average price of $233.00. You can compare and book your stay on Agoda. I’m in it for the Christmas shopping alone! Great post – I visited the Alsace region many years ago when I was backpacking between school and university. I love the photos – I don’t remember it being that beautiful – but I do remember the Christmas markets and the wine!! Great things. I will not gonna miss. Thanks for the post. I’ve never been to this area but would love to get there! It looks like there’s a lot to offer in the Alsace region! I’d especially love to see the view from Chateau Haut Koenigsbourg. Your photos make me want to go there! Wow! These places are stunning! I have never heard of any of them! I was in France for a very short time, so my visit did not extend past Paris, but Alsace has just made it to my bucket list! Thank you for sharing! I also went to the Alsace region many years ago along with my parents and siblings and enjoyed it then. I hadn’t really thought about taking our kids, but you’ve made it sound really temping – it seems like just the kind of gorgeous, historic place we would enjoy. Wow! The view from the Chateau Haut, incredibly quaint houses and macaques! It sounds like Alsace has a ton to offer! I don’t remember Alsace being that beautiful – and I had no idea about the Christmas Shopping.. Alsace is back on the list!! We had an all too brief fling with Alsace at the end of December 2015 and I would love to go back and spend more time. Riquewihr was just incredible. Beaauutiful! We’ll make sure to get there in our trip to France. Do you think it will be easy to get along the villages from one village to the other January with public transpirtation? We are spending a week in Colmar for Christmas. Thank you for the tip on the Christmas decorations! You are so lucky! I hope that we are able to get back there at some stage. Let us know how much you love it.